It’s estimated that more than half of all construction workers frequently work from heights. It’s not surprising, then, that falls are the leading cause of workplace fatalities on construction sites. Did you know that in a typical year, more than 500 construction workers die in from falls from buildings and falls from scaffolding? Scaffolding can be built many stories high and often needs to accommodate numerous workers and all of their equipment, which can increase the chance of death should a worker fall as a result of structural failure. As height increases, so do safety requirements. For example, harnesses should be provided for workers to tie off on the scaffold to limit how far they can fall. Have you been injured or lost a loved one in a scaffolding collapse or failure? Contact the law offices of Goldberg Weisman & Cairo today by calling 1-312-464-1234 and let our Illinois construction accident lawyers review the details of your claim and discuss your legal options. At Goldberg Weisman Cairo, our construction accident attorneys have been helping injured workers for more than 30 years. We know OSHA requirements and we’ve seen firsthand how scaffolding safety problems can occur. Our firm has secured more than a billion dollars in combined verdicts and settlements on behalf of injured construction workers throughout the state of Illinois. We are committed to getting justice and fair compensation for all of our clients. 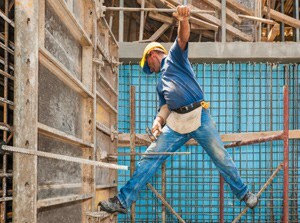 Example Case: GWC obtained $1.14 million in compensation for a carpenter whose heels were fractured in a 30-foot fall from scaffolding when planking broke. Lab study revealed that powder post beetles had weakened the wood planking used for scaffolding. If you or a loved one suffered scaffolding injuries in Chicago, it’s very important know your rights. For more than 30 years, the law offices of Goldberg Weisman Cairo have been the preferred choice of many unions and trade organizations and offer 100% FREE consultations to review the details of your claim and determine if you have grounds to file a damages lawsuit. Call GWC toll free at 1-312-464-1234 or contact our Chicago construction injury law office online via our 24/7 Live Chat or our “Free Case Evaluation” form. … and are ready to help you today. Don’t delay. Having dependable legal counsel during the recovery phase of an injury is an important step of the rehabilitation process. We can help to relieve the stress of pursuing a legal solution to a work related issue and are ready to help you today.